A behind-the-scenes look at the life of circus and zoo elephants. While centered on the story of one performance elephant, Billie, Bradley (Saving Gracie: How One Dog Escaped the Shadowy World of American Puppy Mills, 2010) exposes the seedy, harsh world that all circus and zoo elephants endure in order to learn the unnatural tricks that entertain the public. Vivid descriptions of the history and evolution of the performing elephant world, where brutality by human trainers, substandard living conditions and isolation have forced elephants into submission, merge with the personal storyline of Billie, who was captured as an infant. First used to provide rides to children, Billie soon entered the circus world, where she was trained to do tricks along with four other elephants. 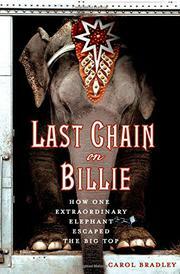 "For five months,” writes the author, “Billie had divided her time between the back of a truck, a makeshift yard outside the circus arena and, for a few minutes a day, performing." As the years passed and Billie was trundled back and forth across the United States, she became testy or "snappy." Bradley identifies other elephants that also became angry and turned on the bullhook-wielding trainers, who were badly injured and sometimes killed. During the 1990s, animal rights activists and a few elephant trainers became angry at the cramped and unhealthy living conditions of elephants across the country, and Bradley enlightens readers on the development of the Elephant Sanctuary in Tennessee, a nonprofit reserve that harbors aging elephants. With the sanction of the U.S. Department of Agriculture, Billie and many other “retired” elephants were moved to the sanctuary, which provides them with a safe and peaceful place to live their remaining years. Graphic details of animal abuse may offend some readers, but the overall story is worth enduring those passages. A moving and informative account of the plight of trained elephants in the U.S. and the efforts of those who have created an asylum for them.